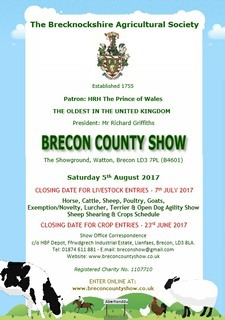 FLYER DESIGN, POSTER DESIGN, CATALOGUE FRONT COVER DESIGN, SCHEDULE FRONT COVER DESIGN FOR THE BRECON COUNTY SHOW TO USE AS PROMOTIONAL MATERIAL - IN-KEEPING WITH WEBSITE BRANDING. 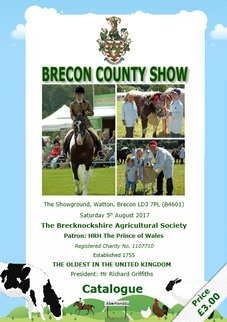 The Brecon County Show is held annually on the 1st Saturday in August at The Showground, Watton, Brecon. 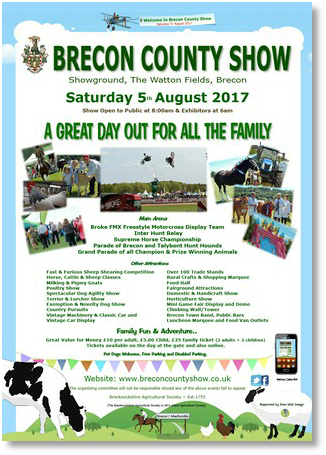 Our Show is based around the Cattle, Sheep, Horse & Pony, Goat classes, & a Poultry Show, which attract exhibitors from all over the Country. The show also hosts a major shearing competition. We have over 200 trade exhibitors bringing you the best in British Farm Produce, the latest tractors & farm machinery and cars to anything for the garden. From clothing and jewellery to hand made cards, there is something for everyone. Combine this with vintage and modern machinery, Dog Show, Food Hall, Fun Fair - rides and stalls for children, a beer tent and much more you will be sure to have a great family day out. The Show attracts over 10,000 people to the show and with over 200 trade stands and main ring attractions there is plenty of entertainment on offer for them.